Central Albertans have another walking trail to take in the sights and sounds of nature. NOVA Chemicals Community Nature Trail, located north of NOVA Chemicals on Hwy 815, is five km of looped trails with a picnic . . .
"Both Trans Canada Trail and Alberta TrailNet will be advised that the project will not be proceeding." Red Deer County councillors have been given an update on a proposed recreational trail north of Springbrook along Rge. Rd. 280 to Twp. Rd. 381. The move came during the recent regularly scheduled council meeting. On June 7 . . .
Local cyclists have vowed to take another shot at getting Red Deer County's help with a bike trail between Springbrook and Red Deer. During its regular meeting on Tuesday, county council turned down a request to build and maintain . . .
Building the Trans Canada Trail in Central Alberta has had many successes in recent years as well as many challenges. Several communities north of Red Deer are now or about to be connected to the largest recreational . . . The future of the Central Alberta section of the Trans Canada Trail is up for debate at Red Deer County Council on Tuesday. For some years, members of the Central Alberta Regional Trails Society have been working on a project . . . The ambitious project to upgrade the nature trail at Napoleon Lake is continuing this spring and could be completed in 2016, a year earlier than planned. Last summer, members of the Rotary Club of Innisfail finished construction . . .
Red Deer County has a little more leg work to do before deciding how best to proceed on a proposed Springbrook-to-Red Deer trail. Grant funding is available to cover up to half the cost - to a maximum of $1.5 million - of the eight-km . . .
On Saturday, May 28, Phil Lodermeier received the highest recognition bestowed by Alberta's provincial trails organization. The Trail Blazer award from Alberta TrailNet Society recognizes and individual, organization . . .
A Lacombe County manager has been recognized for his trail-building efforts. Phil Lodermeier, the county's operations manager, was named 2016 Trail Blazer by the Alberta TrailNet Society. "It's like the Stanley Cup of . . .
Central Alberta's trail system will get a nice boost this summer. Lacombe County is planning to begin building a 15.5-km stretch of trail from the City of Lacombe to the Ponoka County border. Lacombe will build a 1.9-km link . . . I would like to congratulate the Alberta NDP government of Premier Rachel Notley and Minister Brian Mason and the staff of Alberta Infrastructure, Mayor Tara Veer, council, and staff of the City of Red Deer and Mayor Jim Wood and . . . 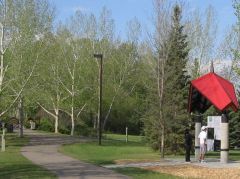 Established in 1988, the Canadian Northern (Meeting Creek) Historical Society, in conjunction with several partners, is playing an active role in the development of an extensive Linear Park system in East Central Alberta. Seven . . .
A Springbrook-to-Red Deer walking trail has taken a big step forward. Red Deer County council approved a route and gave staff the green light to apply to the TransCanada Trail Foundation for up to $1.5 million in funding. The 11-km . 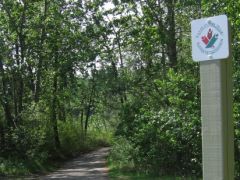 . .
A new coat of paint may be in the works for an important connector in the Waskasoo Park trail network. The CPR Bridge is slated for a $3.7 million repair and paint job as part of the administration-recommended 2016 capital . . . Early this summer, I wrote a column about Red Deer's project to count the users of our trails network in certain areas. I suggested that people would be surprised by the numbers, perhaps even me. Well, I have to admit I am surprised. . . It should come to no surprise that Red Deer's park system is busy. Now the city has data to back up its claim. In July, the city installed six trail trackers to gauge the usage at some of the popular Waskasoo Park system entry points -- . . .
Central Alberta shines as a trails destination where visitors enjoy more than 100 km of trails inside the City of Red Deer and many more trails in the urban and rural municipalities in the region. . . Earlier this year, Frank and Rose Kuhnen donated 146 acres of land just north of Blackfalds near Lacombe Lake to . . . I read the news story about Red Deer becoming the only Canadian city to getting attention for being an international leader in promoting active living with a grain of salt rubbed into old wounds. That's because some of the scars are . . .
Central Alberta Regional Trails Society is hoping both the County and City of Red Deer will partner with them to make a leg of the Trans Canada Trail System a reality between Red Deer and Springbrook. The Society has studied routes . . . I read Paul Pettypiece's commentary in the June 23 Innisfail Province. I wanted to write a letter to support Forth Junction's efforts to preserve and give new life to the Mintlaw Bridge. I think restoring the Mintlaw trestle and . . . There are times in our history when the stars line up to create an unusual opportunity to do something special that future generations will cherish. This is one of those times. A few years ago, Red Deer County was gifted for $1 the . . .
Red Deer County council has received a plan regarding the possibility of developing a regional trail between Springbrook and Red Deer. Councillors accepted the plan for information during the regularly scheduled council . . . I'm betting there will be quite a few surprised people in Red Deer when the results from this summer's trails use survey are made public. Considering how little hard information we have on trail usage, I'll admit that one of the . . .
A group championing a Red Deer-to-Springbrook trail left Red Deer County council without the strong show of support they wanted. "I was disappointed," said Central Alberta Trails Society president Paul Pettypiece on Tuesday after . . . The Kuhnen family always saw potential in a quarter section of land they owned around the south end of Lacombe Lake. A paintball park was considered but dropped when an agreement couldn't be reached with Lacombe County. . . The proposed ambitious Napoleon Lake Trail project, one that ultimately envisions a revamped system around the 2,000-metre circumference of the lake, has been unveiled to the public. Town officials and Barry Gonnelly, a . . .